Blackpool goalkeeper Colin Doyle’s shoulder injury may not be as serious as first thought, writes WILLIAM WATT. The Irishman was forced off in Saturday’s drawn season-opener at Colchester, having impressed on his debut. It was feared the 30-year-old Doyle could miss up to three months of action – a major worry for Pool as they have only one other senior keeper in Kyle Letheren, who made his debut at Northampton last night. But after a scan yesterday, it appears Doyle could be back within a month. 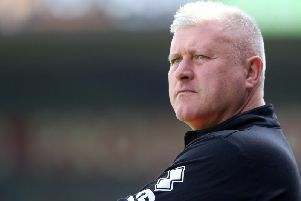 Manager Neil McDonald explained: “Colin’s shoulder has settled down a little bit and it’s not as bad as we first thought. “There’s a little bit of damage there but hopefully it will settle down. Youth team stopper Myles Boney was on the bench last night. The teenager was offered a professional contract two weeks ago but has not yet signed it.